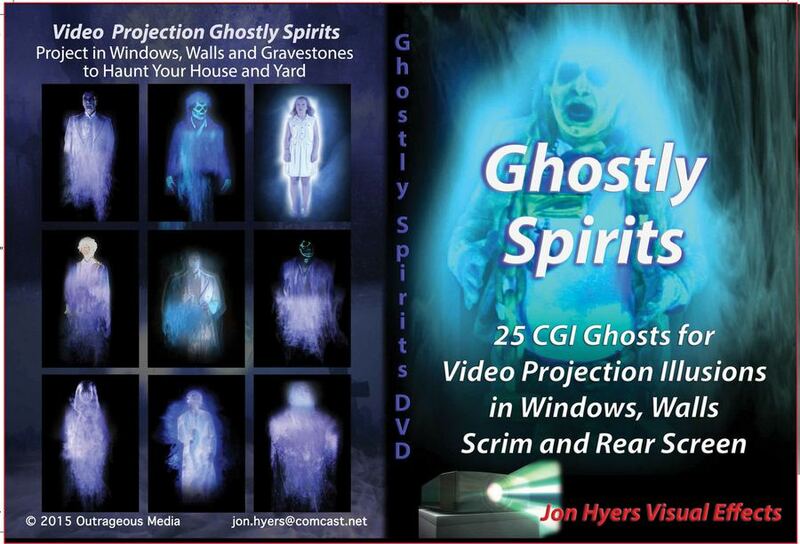 Ready-to-Use Special Effects on DVD for Video Projection Illusions to use for Haunted House, and Halloween Home decorating, to make the illusion of ghostly Spirits walking by a window, or inside a house along a wall. 25 chapters of a variety of ghostly effects. Using a video projector and a white cloth or projection screen you can fill your windows with ghosts, or project directly onto walls. Misty ghosts, human ghosts and historical ghosts float across the screen. Single ghosts appear in some chapters, while flocks of ghosts appear together in others. Project Ghosts onto walls, gravestones, use a big TV or a video projector, to play the effects onto Rear Screen, Polyvinyl Film, white cloth or white walls.